1a. 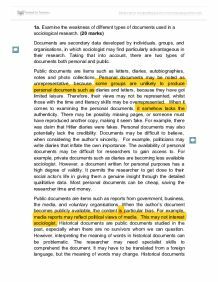 Examine the weakness of different types of documents used in a sociological research. (20 marks) Documents are secondary data developed by individuals, groups, and organisations, in which sociologist may find particularly advantageous in their research. Taking that into account, there are two types of documents both personal and public. Public documents are items such as letters, diaries, autobiographies, notes and photo collections. Personal documents may be noted as unrepresentative, because some groups are unlikely to produce personal documents such as diaries and letters, because they have got limited leisure. Therefore, their views may not be represented, whilst those with the time and literacy skills may be overrepresented. When it comes to examining the personal documents, it somehow lacks the authenticity. There may be possibly missing pages, or someone must have reproduced another copy, making it seem fake. For example, there was claim that Hitler diaries were fakes. Personal documents may also potentially lack the credibility. ...read more. The researcher may need specialist skills to comprehend the document. It may have to be translated from a foreign language, but the meaning of words may change. Historical documents unrepresentative, because some documents can get lost or destroyed, giving an incomplete and unrepresentative picture of the past. Alternatively, public documents can be easily accessible, because someone else has already gathered the information. The existing document saves the sociologist time and money. Furthermore, positivist tend to reject do document because they lack representativeness, reliability, and generalisability. They are often unreliable. They are often unreliable and unstandardised. 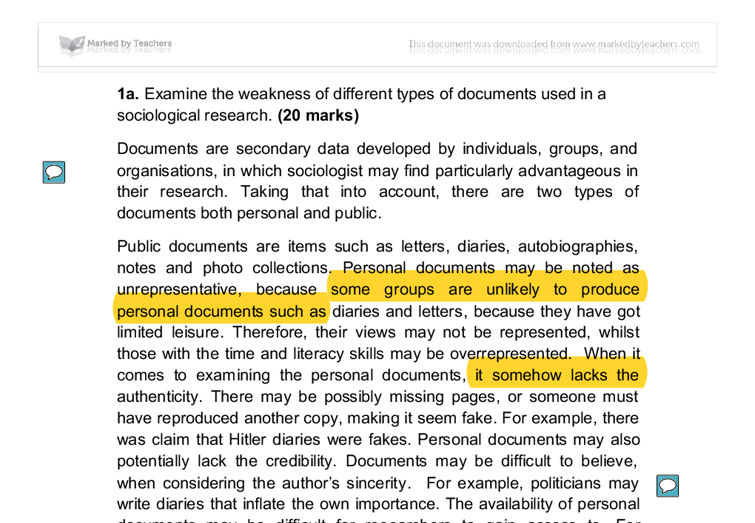 For example, a person diary is different so it makes it hard to generalise from. They can be unrepresentative, because a minority of people write diaries and letters. Interpreting documents is challenging, because researchers use their own meaning. 1b. Examine why positivist prefer quantitative data whilst interpretivists prefer qualitative data (20 marks) Sociologist choice of research method is influenced by their methodological perspective, which is their perspective of what society is like and how we should examine it. ...read more. This may not be necessarily true, because the interpretivist decisively argued that social actor's behaviour is predominantly based on meanings they give to a situation, not the they influence of external or social forces. Positivist purposely used quantitative data to discover and measure the causes of these behaviour patterns. When examining the data, sociologist can discover the scientific laws of cause and effect that determine social actor's behaviour. Whereas, the interpretivist uses qualitative data to discover and describe the meanings held by social actors. When interpreting the qualitative data, interpretivsit can uncover the subjective meaning of social actor's behaviour. Furthermore, when a sociologist chooses which methodology to use, there are practical and ethnical limitations. Questionnaire data have problems to do with sampling frames, the geographical distribution of sample, question design, planning time. On the other hand, there are practical problems concerning gaining trust, access etc. However, sociologists do not need to make a choice between quantitative and qualitative research methods. They could the triangulation process by combining two of the different research methods to complement one another- with the strength of one balancing out the weakness of the other. ...read more. This is a good answer showing a strong understanding of the methodological issues in both question one and two. The candidate should try to use more named examples to give evidence when making a point. In question two the candidate could link to perspectives such as Feminism, Marxism or Functionalism to advance their marks further. He also makes a contrast with undeveloped and under-developed countries, undeveloped countries have no manufacturing sector and also no interface to change this whereas under-developed countries have some manufacturing as a result of an external interface yet are poor. Underdevelopment is the process where the economy of a third world country is distorted by the TNCs of a western nation. Philosopher Karl Popper argued that it is impossible to prove a scientific theory true by induction because no amount of evidence assures that contrary evidence will not be found. Instead, he suggested that proper science is accomplished by deduction. Instead of looking for the proof of their hypothesis, scientists should look for their disproof. Unstructured interviews also have ethical issues. The ethical advantages are that unstructured interviews are particularly useful when researching sensitive topics. This will help the interviewee to feel comfortable discussing difficult or personal subjects, such as abuse, as there are no set answers and discussing topics in an informal manor forms more of a relationship between the interviewer and interviewee. Many of the members also found it easier to confide in her as she was unemotionally uninvolved. And because she just listened she found herself collecting lots of 'classified' information without even asking for it. This gave the study validity as there was no need for the members to lie to her. Comparing questionnaires to other research methods, we can see the difference in the data collected and why each theorist likes a particular research method. For example, interviews are preferred by feminists as they allow you to collect qualitative and in-depth information about the participant. give me a pen to write and I felt odd because I was the only one who forgot my pens. Also, Mac an Ghaill found that negative labelling did not necessarily lead to failure. Teachers labels and assessment of pupils may affect the band or set they are placed in . Ball found that pupils who's fathers were not manual workers were more likely to be placed in top sets. The word conflict describes those perspectives which assume that, in society, groups exist with differing interests. Even though these two theories oppose, they do have some similarities. They both offer a macro-explanation of society meaning they both look at the overall structure of society, rather than looking at individual views.